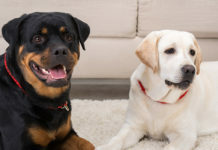 In this article we look at how to get your rescue dog off to a great start in his new life as a member of your family. [wp_ad_camp_5]Bringing home a rescue dog is a big moment for you. We’ll look at some of the challenges you may face after collecting your Labrador from the shelter. And I show you how to overcome them with simple, practical tips that will help settle in your new dog and make him feel at home. 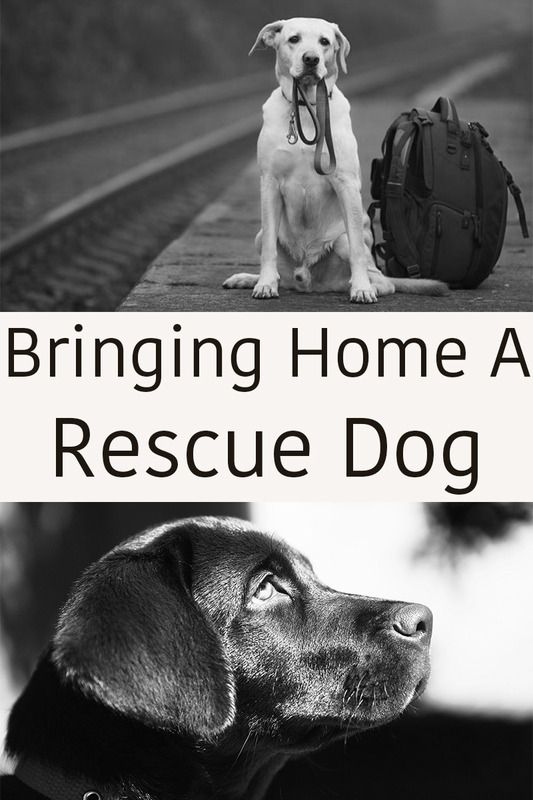 What is it like to bring home a rescue dog? Bringing home a rescue dog is in some ways very different from bringing home a new puppy. And in others very similar. A rescued dog has a past, a history, in which you played no part, and which may have left him with some emotional healing to complete. 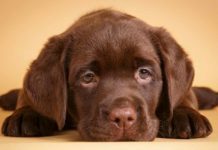 A full grown Labrador is less portable than a puppy and may have some habits that you need to work on together. He may also feel upset and homesick just as a new puppy would, and need extra patience with house training and basic manners. On the other hand, he may well be quite well behaved, have a good understanding of basic commands and be well past the chewing, frequent toileting, and biting stages that can make puppies so demanding of your time. Because you won’t really know what to expect until you get him home, it’s a good idea to make sure you are ready to spend a lot of time getting to know your new friend. 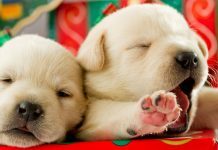 [wp_ad_camp_2]Taking a few days off work, or scheduling time in your diary just for your dog, and making sure you have no major commitments for the next week or two, is a really good idea. You’ll be able to spend that time helping your dog to settle in and feel safe, and to help him adjust to happily spending time in your home without you. Let’s look at some of the preparations you’ll need to make before the big day. It’s a good idea to assume that your dog is not house-trained, even if you know that he is. This is because all dogs, when stressed and placed in a strange situation, may have a breakdown in cleanliness. This is much easier to deal with if you plan for it and expect it. Make sure you have the right products for cleaning up any accidents. It is important that a rescued dog lives as part of your family. Sharing your home, and much of your life. Most shelters will not allow you to adopt one of their dogs if you plan on him sleeping in an outdoor kennel, or spending his days shut out in your yard. Holidays and outings may take a little more planning, but they will also be a lot more fun. In fact, he’ll feel more secure if you do. The smaller the area your dog has to get used to initially, the more likely he is to treat it as his home and keep it clean. Washable floors will make it easier to cope with any accidents, and plenty of human company will help alleviate any home sickness and fear. A family room such as the kitchen is ideal. Many people like to set up a nice bed for their dog. Of course, some of those beds never get slept in because their dog joins them under the duvet each night. Whether or not you are going to allow your dog to sleep on the sofa or even in your bed is entirely up to you. There is no harm in this provided that your dog doesn’t have any tendency to resource guard. But it’s worth thinking about in advance as its usually better to begin as you mean to go on. Dogs are happier if they know where they stand and what the house rules are. If you are certain that you don’t want dog on your furniture, make that the rule from day one. If your dog is used to sleeping in a crate, it’s best to continue this to begin with, you can transition to a basket later when he is more at home. If you know that your new dog isn’t potty trained yet, or is prone to accidents, you will definitely benefit from using a crate at night for the first six months. Potty training an older dog takes time and patience, but can be done. I recently brought into my home a seven year old dog that had lived in a kennel all her life and never been house trained. I crated her at night and when I went out during the day for the first four months. This, combined with making sure I got up very early in the morning to let her out after de-crating her, meant she was clean and dry in the house within six months, with very few accidents in between. Remember, if your dog isn’t used to a crate and you want to introduce one, this is best done in gentle stages. The same applies if previous owners have abused the crating system and left him shut in for too long so that he now dislikes crates. If your dog is not going to be crated, then you need to make safe any area where he will be left alone. Put away your prized Persian rug. Make sure there are no precious ornaments or favourite plants that can be swept off by his wagging tail. Remove anything so precious that you will have heart failure if he chews it, and make sure there are no trailing electrical cables for him to munch on. Avoid soft toys, cheap plastic toys that come apart when chewed, or very padded bedding for now. Not all Labs will chew their bedding or your belongings, and most over three years old won’t, but be safe until you know your dog. Senior dogs can be an absolute joy. They are often past the bouncy, knocking over fragile people, stage. And are likely to be calm and gentle companions. Your senior shelter dog may sleep a lot and be happy just to lie down near to you, but most will still want and need a daily walk. Older dogs do however need a little extra care and may have some medical issues that need attention. If your new friend is elderly or arthritic, he may need a ramp to get in and out of the car, or up and down any steep steps in your yard. He may also need extra padding in his bed, or if you intend to let him share yours, a ramp or dog steps to reach it. 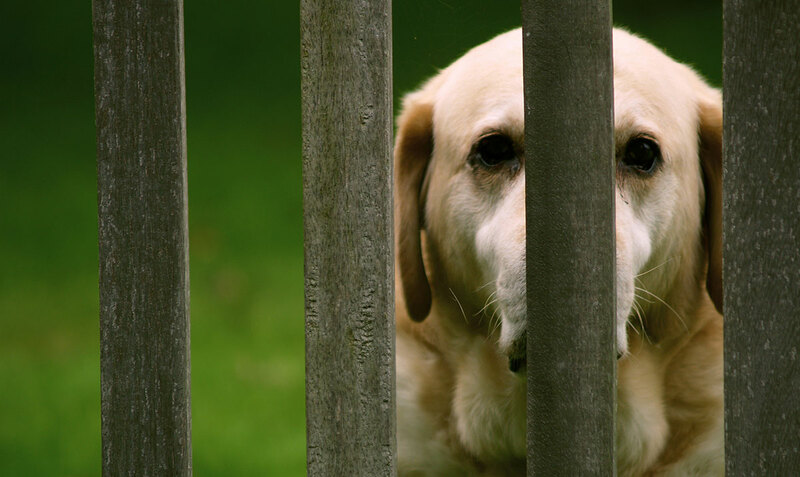 Like elderly people, some older dogs can suffer from forgetfulness and may show signs of cognitive decline. But that doesn’t necessarily stop them spending a happy few years in the comfort of your care. It is very important to make sure that your yard or garden is secure, or that you have a safe enclosure within it where your dog can relieve himself and get some fresh air. Many rescue societies will have visited your home in advance and will advise you on this. If not, you should assume that a fit Labrador is capable of climbing over a fence that is less than six feet high or digging under one that is not turned under or sunk below the surface of the ground. Most Labradors are also capable of pushing through all but the most impenetrable of hedges. Daily walks are important for all but the most infirm dogs. And your Lab will probably need an hour and a half to two hours of exercise a day. 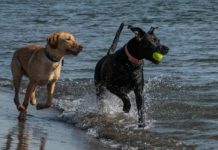 Ideally, much of this will be off leash – but you’ll need to take precautions against losing your dog. Especially if you know that he has a history of absconding. You’ll need some kind of ID to attach to your dog’s collar or harness. This is a legal requirement in many regions, and a sensible precaution in case your dog ever gets lost. The ID tag should have your surname and your telephone number. You may want to skip putting your dog’s name on the tag as some people feel that this makes it easier for thieves to steal your dog. A body harness is a much better way of restraining a dog than a collar. Many rescue dogs have not been trained to walk quietly alongside their human partner and will pull and strain on the leash until their training is completed. Unless, and even if, you have been assured for certain that your rescue Lab is well trained with an excellent recall, you’ll want to have him wear a long line outdoors. This is a long trailing line that clips onto the back ring on his harness. It is an important safety precaution to begin with. Find out what the shelter have been feeding him and stock up on that – changing food at this point is not going to help him settle and may upset his tummy. Find out what time he is used to being fed and walked too as this will all go towards helping him feel mentally and physically at home. Okay – you are all ready to go. You’ve bought food, bowls, leash, bedding, a crate, and secured your yard. What happens next? Let’s think for a moment about how your dog might be feeling when he arrives in his new home. Because this will influence his behavior and the way that you manage him. Being adopted is a bewildering experience for a dog, no matter how hard you try to help him. [wp_ad_camp_1]Everything is new and he is bound to feel confused. Because Labs are usually very friendly sociable dogs, it can be easy to assume that the new dog is fine. His tail will wag, he’ll probably eat anything you put in front of him. But that doesn’t mean he has forgotten his past life. He still needs a lot of attention and human contact for the next few days. Some rescue dogs are fearful and anxious to begin with and need a serious amount of kindness and patience to bring them out of their shell. If your dog was well cared for before, the more you can replicate his familiar routine, the easier he may find it to settle in, so find out as much as you can about what his previous life involved. Your dog is not the only one undergoing a life changing experience. You will have a strange dog in your house and you probably won’t fall in love with him right away. So it is going to feel odd at times. You may even have moments of panic or regret, and question your own ability to cope with this stranger in your midst. This is normal and these feelings will usually pass within a few days. If they don’t, or you feel overwhelmed, it’s important to talk to someone about them, and if necessary, to contact the rescue center for help and advice. Discovering who is the boss? At one time, new dogs used to be accompanied by strict instructions to show him who is the boss. Some older books and leaflets still dish out this advice. Happily, that’s one thing we don’t need to worry about any more. Studies have shown that most dogs don’t want to be in charge and are motivated by getting access to resources, rather than by any kind of wish to be ‘top dog’. This particularly applies to compliant breeds of dog such as Labradors and other gundog breeds. You are the one with the opposable thumbs and that puts you firmly in charge of resources. Therefore by definition you are in charge of your dog. Your role will be to train him how to respond to different situations in your home, and to the cues or commands you give him. This isn’t as difficult as it sounds and you can find lots of help and information in our training guides. TRAINING TIP: Don’t overfeed your dog and if he is very shy or indifferent to you at first, use the hand-feeding techniques outlined below. Your priority is to make friends with your dog and show him the ropes. Thankfully, all training these days, can be done using positive reinforcement. If your new friend is shy, the more low key this event is the better. Try to avoid taking a lot of noisy teenagers along for the road trip. Just you and one adult helper – to sit with the dog if necessary – is ideal. Some dogs get car sick so take some old towels and wet wipes in case you need to clear up. If your dog is used to travelling in a car crate this is ideal. Some easy going dogs will be happy about climbing in and out of crates even if they aren’t used to them. If the dog is panic stricken at the though of getting in a crate, it may be better to have a friend sit in the back with him. Although you may have met him once or twice, for the next few days this dog is probably still a stranger to you. And that means taking some sensible precautions. Its important to begin by assuming that your dog may be nervous and that he may feel threatened. Even dogs that are usually good tempered may bite if they are scared. There are sensible precautions you can take to avoid being growled at or bitten by a dog that temporarily feels completely out of his depth. Don’t cuddle him yet – many dogs dislike being cuddled and find it threatening. Never try to kiss a new dog. Make sure children follow these rules too. Give your dog space and chance to get used to you. If your dog does growl at you, whatever you do don’t get angry or punish him. It is the early warning system that precedes a bite and will help to keep you safe. If you punish a dog for growling he may give you NO warning next time. The day you bring your dog home is an exciting one. For you and all your family. Depending on your dog, he may be excited too, but he will also feel stressed and upset at being moved into a strange house with people he hasn’t known for very long. If he is shy, and just wants to hide away in his bed, don’t try to force him to play or interact with family members. Concentrate on making him feel safe and secure there, and he will gradually begin to explore his new home. This may take several days, but don’t hesitate to talk to the rescue center if you are worried that your dog is not making progress. Some dogs are very distant at first and don’t seem interested in family members. Most rescue dogs benefit from hand feeding. Sharing food is a great way to build a bond with your new dog. Each time you offer him food, his trust in you grows. And with it a confidence that the people around him are kind and well meaning. If your dog gets all his dinner in a bowl, in the traditional way, you are only going to have one or two opportunities to build that trust each day. Imagine how much more quickly his confidence in you is going to grow if you can feed your dog ten times, or even a hundred times each day. Which of course you can, especially if you feed him on kibble. 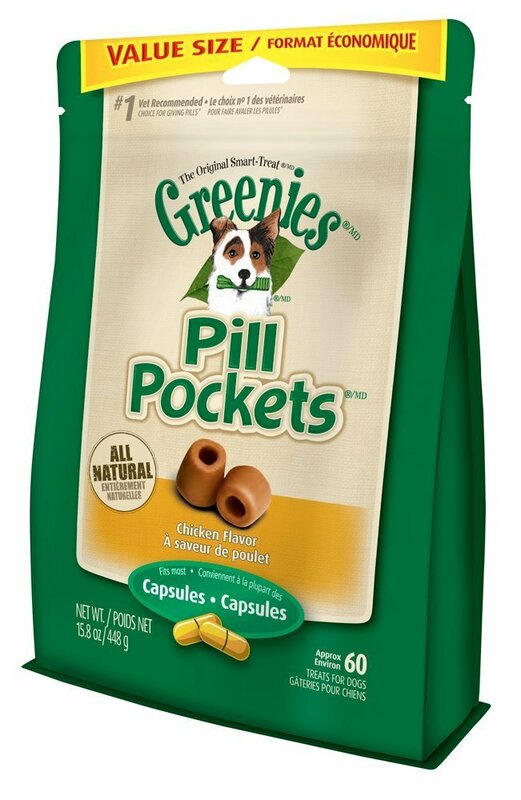 All you have to do is keep a treat pouch attached to your belt or in your pocket and put some of your dog’s daily food allowance in there. Keep offering him pieces of kibble throughout the day. After a few days you can start being a bit selective. And feed him when he is behaving in ways that you find desirable or acceptable. This helps to make everything you do together feel good and safe. It is possible to use your dog’s entire daily food ration up with hand-feeding, and no, your dog won’t get fat as long as you deduct what is hand fed from his total daily allowance. Handle your dog calmly and quietly. This is especially important if he is nervous or anxious. You may need to be patient with him. Avoid physically manhandling the dog in any way. Use luring and houselines to manage him if you need to move him around (to get him off the couch for example). Training techniques should be modern and based on positive reinforcement – creating and maintaining desirable behaviors using rewards. Many dogs have never learned to obey basic commands like ’sit’ or ‘come’, or may associate commands with violence or punishment. Assume your rescue dog knows nothing and train him yourself from scratch using the detailed guides in our training section. If your new dog is already well trained it will be a refresher course for him. If he is not, he will have the pleasure of learning from you in a safe and loving environment. Some rescue dogs have a history of absconding. Assume that your dog may not want to come back to you at first. This means not letting him off the leash outdoors for the first couple of weeks, until he has begun to build a bond with you. And keeping him on a long line and harness outdoors for a week or two thereafter while you assess his level of obedience. If you have a good sized garden, you don’t need to worry about going for walks for the next few days while your dog settles in. He won’t come to any harm with a short time without formal exercise and he needs to feel safe and confident in you before you go out and about together, especially if he is anxious. Many people don’t like the name of their dog, but don’t realise that it is easily changed. Let your dog settle in for a few days, then pick a new name. Each time you say his old name, say the new one immediately before it. So, if your dog is called ROVER and you want to change his name to GARY – all you do is say ‘GARY ROVER’, together in a pair. After a couple of days, leave a two second gap between the names and then start dropping ROVER from time to time. You’ll soon find your dog responding to GARY, all by himself. All dogs have to be alone sometimes. Some rescue dogs have abandonment issues and are afraid of being left alone. But this fear can usually be overcome with patience. Ideally you will be able to spend a lot of time with your new dog to begin with. After a day or two, you can start rewarding your dog for short periods alone. Start with just a second or two if he is anxious. Scatter a few treats before you leave then disappear behind a door and reappear almost immediately bearing more treats. Increase the time you disappear for slowly, second by second, then minute by minute. Once you are leaving him for more than a couple of minutes, or if he seems distressed by even the most momentary absence, give him a frozen kong to chew before you leave. If he howls the minute you go out of sight use the click for quiet routine to teach him how to be alone and not make a noise. Avoid leaving your dog for long periods of time during this adjustment period. Make your absenses short and your returns sweet. If you do this in careful stages, you’ll soon be able to pop out to the shops for half an hour, without your dog getting upset. Most dogs have aspects of their behavior that could do with improving. Not just rescue dogs. Once the first few days are under your belt, you’ll want to start thinking about training your dog, and maybe ironing out a few faults. You can read up on how to stop your dog pulling on the lead, or how to prevent him jumping on visitors right here on this website. You can also find out how to deal with dogs that run away, and read up on some of the other activities that you can get involved in with your dog. It’s good to be prepared for housetraining problems, behavior problems, running away and so on, because preparation helps you to cope. But happily, many rescue dogs are actually fairly problem free, and much of the information above probably won’t be needed. The main thing to remember is that this is all very new and a bit upsetting for your dog, his real personality and charm will come out like the sun as he starts to relax. As the days slip into weeks, you can begin to incorporate your new dog into all aspects of family life. Introducing him to your friends and to their dogs. Taking him on outings and training trips. How about you? How long did it take your rescue dog to settle in? And what is your best tip for others who are bringing home their first rescue Labrador soon? Next articleMy Labrador won’t swim! we rescued a yellow lab mix 5 years ago and recently rescued two red labs that were traumatized. they are mother- daughter. the daughter is 1.5 years old, mom is 3. the daughter is fearful and skittish especially around our teenaged daughter. the oldest, original lab has been a gentleman to the new girls. it has been 2 months and I can not imagine our home without the 3 of them. we’re trying to be patient with them still and assume they weren’t trained before. it’s beed tough, to be sure. we need as much training and patience as they do. my priority right now is helping the youngest red lab to stop barking at our teenager. any suggestions? I rescued a four month old they say She is a lab mix but she does not want to come in the house at all at first she would come and go as I did and I would let her in and out when she wanted but at night she stopped coming in so I would give her a treat she got used to that and now she simply won’t come in. I don’t know what to do because I can’t leave her in the backyard because we have coyotes and foxes that ran our fence line and I’m afraid they will kill her can you help me in anyway why thank you and have a very blessed Week. Do yourself a favour … rescue a lab…. or get a lab… treat them with a great deal of love and you be smiling every day…. Whoever took the photo of the beautiful lab at the train station with the lead in his mouth and the suitcase must have been inspired…. How can you not be touched or not be inspired to take in a lab wayfarer to be rescued. We have a 3 year old LR and have been thinking about getting a rescue lab. Hey Phil…..We have one big dog…a lab retriever…and he is the honarary third member of the family being my lovely wife me and him…he comes and goes in and out of the house all the time and sleeps on the bed at night. I like the fact that you are prepared to spend time with pups to get them used to sleeping outside… well done. We just adopted a chocolate Labrador who found us and climbed into our backyard (over our 6 foot fence). We searched for his owners but no one has reported him missing. He’s a beautiful, sweet, well-trained boy! We love our Jack very much already and he has made a very easy transition into our lives. He’s good with our bossy little dogs (a male Chinese crested and a female dachshund-jack russell mix). He is very much a field/working dog, so we are looking for ways to keep him busy (that don’t involve him “helping” me to round up our chickens. Any suggestions for our mysterious fella? Thanks for this article! We are bringing a two year old lab rescue into our home on Wednesday so this was incredibly useful and relevant. This will be our second rescue dog. We were extremely lucky with our first rescue. She was a well trained five year old chocolate lab who really just required us to reinforce her behaviours positively. Still, there was a clear emotional toll on her and giving her space to explore and become adjusted was critical.